Bishop F. De Asis Aguilar in “News of Segorbe and its Bishophood”, 19th century. 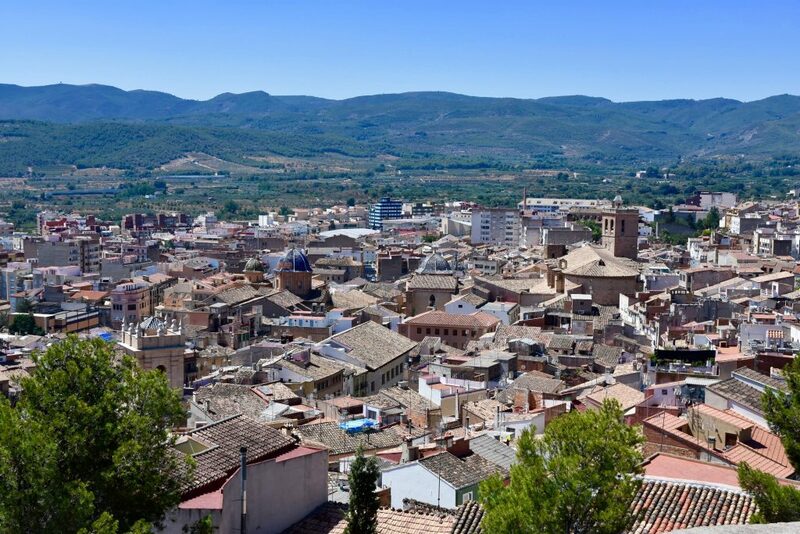 Unless you are a hard-core Hispanophile with an itch to see every corner of Spain, you are unlikely to visit Segorbe, a small town in a mountainous province of Castellon, 50 kms from Valencia. However, there is a chance to end up there in September to witness the Bull Running Week (Semana de Toros), which allegedly attracts around 200,000 visitors each year or, like us, be invited to the friends’ wedding. Chris, our American-born groom, has paternal roots in the area near Segorbe so when we received an invitation, we got very excited. Short but very busy wedding weekend in Segorbe was a great start of our 10-day Andalusian vacation. Province of Castellon is a part of Valencian Country, 4th most populous autonomous community of Spain. The Greeks established colonies in the coastal towns of Saguntum and Dénia as early as the 5th century BC, where they traded and mixed with the local Iberian populations. After the end of the First Punic War between Carthage and Rome in 241 BC, the Carthaginians occupied the whole region. The dispute over the hegemony of Saguntum, a Hellenized Iberian coastal city with diplomatic contacts with Rome, destroyed by Hannibal in 219 BC, ignited the Second Punic War, which ended with the incorporation of the region to the Roman Empire. The Romans founded the city of Valentia in 138 BC, which throughout centuries overtook Saguntum in importance. After the fall of the Western Roman Empire, during the barbarian invasions, the region was first invaded by the Alans and finally ruled by the Visigoths, until the arrival of the Arabs in 711, which left a big footprint in the region, still visible in today’s Valencian landscape, food and culture. After the fall of the Caliphate of Cordoba, two main independent Taifas were established in the region, Balansiya and Dénia, along with a few other small and fleeting Taifas and the short lived Christian conquest of Valencia by El Cid. But the origins of present-day Valencia date back to the Catalan–Aragonese colonization of the Moorish Taifa of Valencia, which was taken by James I of Aragon in 1238 during the Reconquista. The newly founded Kingdom of Valencia was granted wide self-government under the Crown of Aragon. The kingdom experienced golden age in the 14th-15th centuries, as it became the Crown’s economic capital (silk trade) and contributed with the most important works of medieval literature. It also acquired an immense political power with the ascension of the Valencian House of Borgia in Rome. After the Expulsion of the Moriscos in 1609 by the Hispanic Monarchy, Kingdom of Valencia suffered an unavoidable decline as a third of its population and its main labor force were ousted out. Self-government continued after the unification of the Spanish Kingdom, but was eventually suspended in 1707 by Phillip V of Spain due to the Spanish War of Succession. As the result, the institutions and laws created by the Furs of Valencia (Furs de València) were abolished and the use of the Valencian language was forbidden. Consequently, with the House of Bourbon, a new Kingdom of Spain was formed implementing a more centralized government and absolutist regime than the former House of Habsburg. Valencian nationalism resurged towards the end of the 19th century, which led to the modern conception of the Valencian Country. However, the first attempt to re-gain self-government in modern-day Spain was during the Second Spanish Republic, in 1936, but the Civil War brought the project to a halt. Self-government under the Generalitat Valenciana was finally reestablished in 1982 after Spanish transition to democracy. The Valencian Statute of Autonomy states that Valencia is intended to be the modern notion of self-government combined with the traditional interpretation of Valencian identity, as being the successor to the historical Kingdom of Valencia. My husband and I caught a very late flight from NYC to Madrid and arrived to Spanish capital at 9.05 on the following morning. 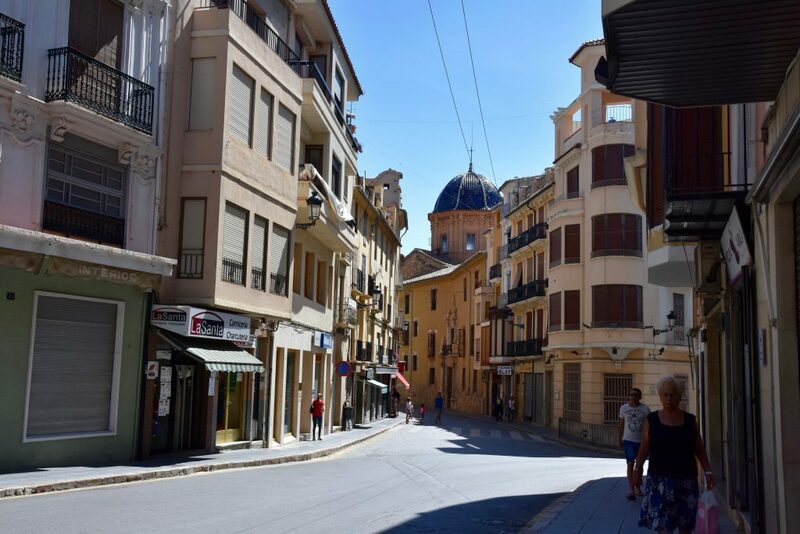 At the customs, we were asked about our vacation plans and itinerary, and when we mentioned Segorbe as our first stop, everyone had a look of amusement or distrust. It isn’t hard to guess the follow-up question: “Why?”. After clearing the customs and picking up a rental car, we, tired after a sleepless overnight flight, but excited embarked on the 400 kms journey to the east. 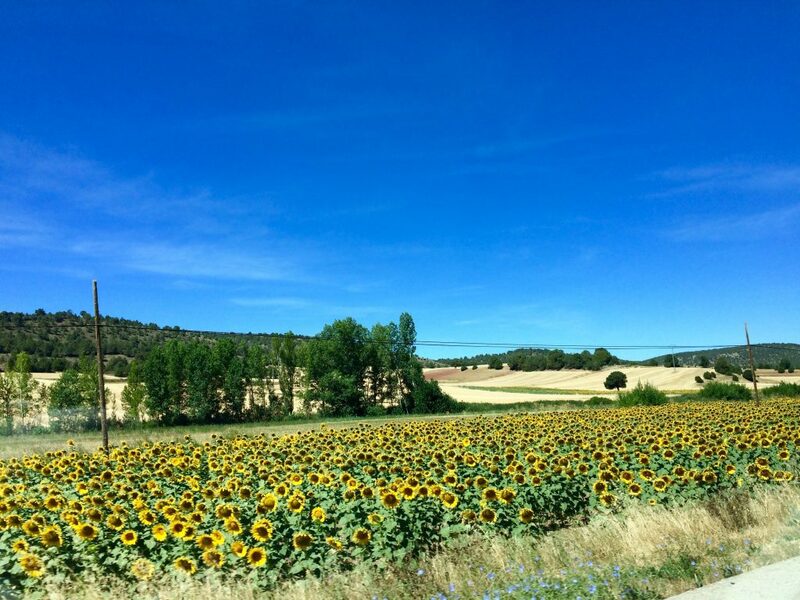 En-route, we passed innumerable fields of blooming sunflowers, which, depending on the time of the day and the sun location, would turn their “heads” always towards the sun. 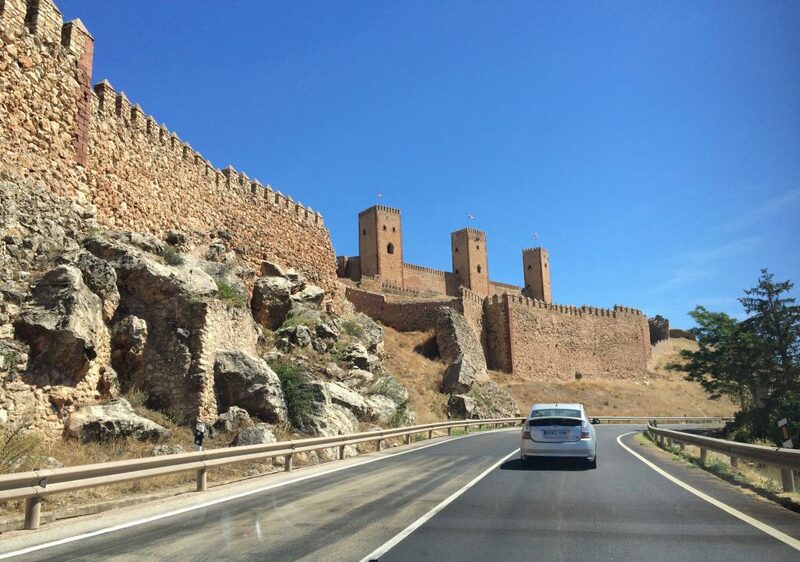 About half-way to our destination, we passed through Molina de Aragon, dominated by one of Spain’s most spectacular castles. Located on a hill commanding the surrounding valley, it is formed by an external line of walls with four gates and numerous towers, which defends the internal fortress. It was built as a Moorish fortress in the 10th-11th centuries, over a pre-existing Celtiberian castle and was used as residence of the lords of the Taifa of Molina. El Cid resided here when he was exiled from Castile but when the castle was conquered from the Moors by Alfonso I of Aragon in 1129, it became the Lara family’s property. After another 30 mins, we stopped in a small town of Monreal del Campo for lunch. The town of 2,636 inhabitants was established as a fortress somewhere between 1121 and 1124 by the King Alfonso I. 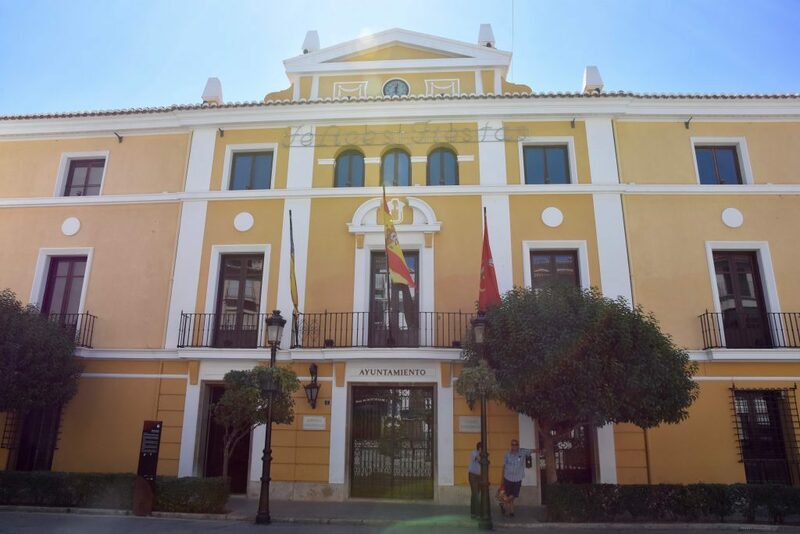 It is home to the first military order founded in Spain as well as the scene of bloody battles in two of the Carlist wars of the 19th century. We went to La Dispensa de Monreal, a mix between a deli and a restaurant, which turned out to be a busy place for such an empty town. Because my husband went to the airport straight from his midtown Manhattan office, he was still wearing his formal suit pants and white office shirt. Humorously, not only did he look out of place at this deli but also some customers confused him with a waiter. Jamon (Spanish ham) & cheese sandwiches, topped by a slice of apple meringue pie were a hit with us. Undeniably, food tastes so much better once you enter Europe (or maybe leave the US). Refueled by food and strong Spanish coffee, we continued to our final destination. Once we reached Segorbe, we found our hotel, Martin El Humano, parked the car (no problem with parking) and after checking-in, spent the entire afternoon napping. The hotel turned out to be very nice, a former convent converted into a hotel and spa, with large event facilities. The rooms and services varied but were very satisfactory. One comment though, the entire hotel had only one iron, which was really hard to get hold of as most of the 100 wedding guests stayed there and needed it at pretty much the same time. Our friend Joel, joined us in Segorbe from NYC and he brought his little Pomeranian dog Sam with him, which almost caused him a trouble. No, Segorbe isn’t a pet friendly place. 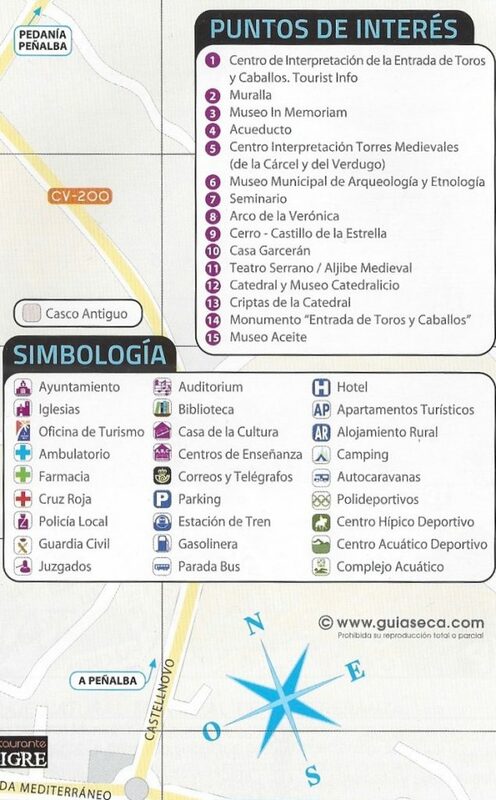 History and layout of Segorbe. Return to the epigraph, written by Bishop F. Aguilar at the end of the 19th century in his work “News of Segorbe and its Bishophood.” And, indeed, if one thing stands out about Segorbe, then it is its privileged geographic position, next to the Palancia river, on the natural route that unites the coast with the highlands of Teruel and on a wide hill (the hill of Sopeña) that rolls towards the valley, fertilized by abundant fountains and springs. Sopeña has been throughout the history focus of cultures and center of the population. Its plateau-shaped form, with pending pronouncements that offer a perfect defense against possible enemies and its dominion of the valley that surrounds it, give it an unbeatable strategic position, and explain why the summit was occupied permanently from the Pre-historical time. Although the scale of successive buildings at the top have covered or destroyed the oldest levels, the archaeological remains confirm the existence of the first settlement during the Bronze Age. Later, in the Iberian Period, numerous remains of ceramics corroborate the hypothesis that the summit continued to be inhabited, however, with the exception of ceramic fragments, there aren’t any other vestiges left. The original name of Segorbe is thought to be Segobriga. The meaning of the root “Seg” (as that of the Germanic word “seig”) is “victory” or “force”, which, according to one theory, characterizes the city. The ending “briga”, meanwhile, is a word of Celtic origin that means “strength”. Another of the theories about the origin of the name of Segobriga is offered by Bishop Aguilar in his book “News of Segorbe and its Bishophood” (Aguilar, 1890) in which he reports that the Iberians called this city Segorb, which in that language would be equivalent to “Elevated City or City High”. Later, says Aguilar, with the arrival of the Celts and their fusion with the Iberians, it would form the settlement, called Segobriga. We can say that the Romanization of the Upper Palancia was profound. 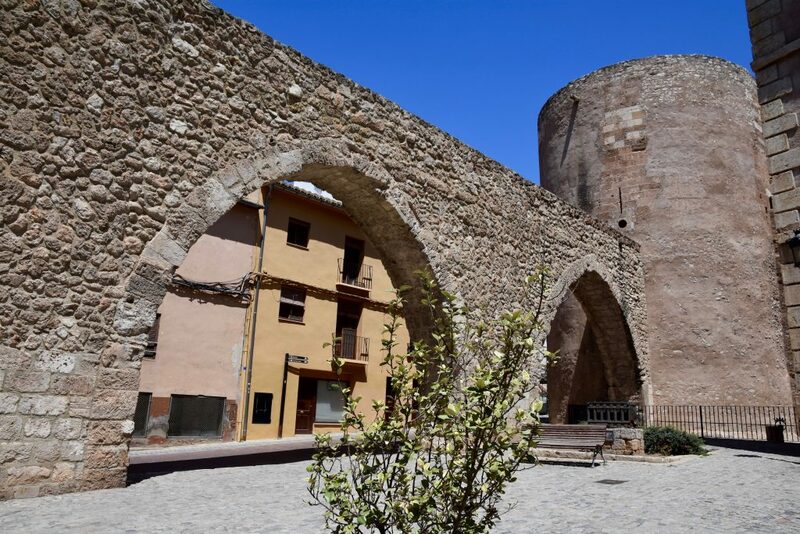 At the foot of the old causeway that connected the coast (Saguntum) with the interior on its way to Bilbilia (Calatayud), the Roman era brought an important development of the entire Palancian valley. Plenty of remains preserved in several regional towns and other artifacts currently missing but mentioned in ancient sources (ceramics, coins and tombstones) could testify this fact. And even though the hill of Sopeña continued to be occupied, most of the population descended towards the valley in search of the fertile lands of the plain. The most important fact of Segobriga in the Visigothic era, is the historical record of the existence of its episcopal seat, inasmuch as in 546 the Valentinian Council was celebrated and attended by the Segobrian prelate, according to various sources. When the king Reccared I renounced Arianism in favor of Catholicism in 587, it was celebrated, in 589 at the 2nd Council of Toledo. The first known bishop of Segorbe was Proculo who occupied seat 28 in this council and from then on, there are references of the attendance to almost all the Councils of Toledo on the part of the bishops of Segorbe. After the Middle Ages, the city continued to be an urban center of some importance. The beginning of the 19th century, brought a slow decline, first to the central government, and later the failed industrialization (primarily textile base) led to economic stagnation. Nevertheless, the 19th century was still rich in facts – Segorbe was the second Spanish city to have public electricity and the area gave Spain a lot of important characters, such as Canonigo D. Miguel Cortes, a liberal who participated in the Cortes de Cadiz, several Segorbinos gained the post of provincial governors (D. Gonzalo Valero or Mantero), some became scientists (botanist D. Carlos Pau) or famous explorers and engineers (D. Julio Cervera and Bavier). Segorbe also contributed to be the Episcopal Seat that is associated today with famous personages like Benedict XIII (the Pope Moon), as well as Rodrigo de Borgia, later Alexander VI, the bishops Cano, Ahedo and Fray Luis Amigo. What I found to be very interesting is that Segorbe is still a duchy, and the present holder of the dukedom is Don Ignacio de Medina y Fernández de Córdoba, Duke of Segorbe, who is married to Princess Maria da Gloria of Orléans-Braganza. The modern town of Segorbe (population is 9,000 people) is immersed in a fertile plain, washed by the Palancia river. It is a special place that takes you almost immediately to medieval times, yet still lurking in its corners are the remnants of different cultures – Romans, Muslims and Christians. Its medieval layout conceals several architectural gems, like the cathedral, and the vestiges of the ancient wall. 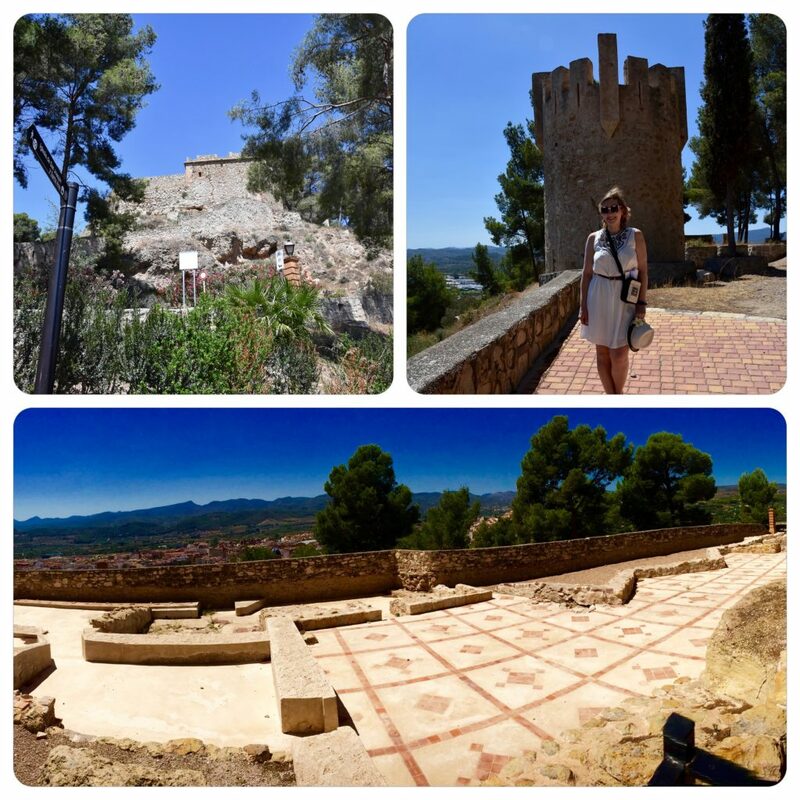 The remains of the castle, located on the neighboring hill of La Estrella, recall the regal origins of Segorbe. The square of Agua Limpia (“Clean water”), so-named because of the plentiful springs found in the area, is the heart of the town. Plaza is framed by the City Hall, built in the 16th century to serve as the palace of the Duke of Medinaceli. The cathedral was built in a Gothic style, and later remodeled following Neoclassical canons. Its interior has seven chapels and a beautiful cloister, and guards a precious codex down in the archives, as well as a collection of paintings in its museum. Several churches stand out in the medieval layout of the city: the churches of San Pedro, San Martín, San Joaquín and Santa Ana. 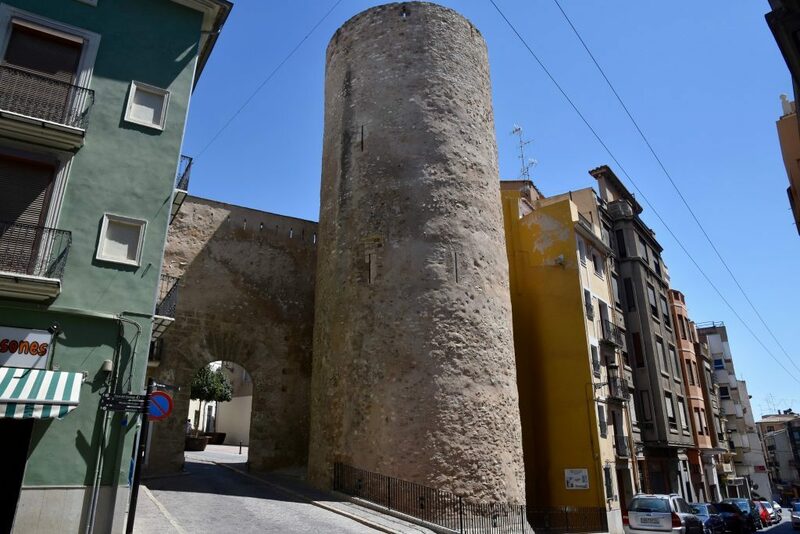 From its defensive past, the town still preserves the circular tower of Botxí and the prison’s tower, which used to be a part of the ancient wall along with the arch of Verónica. But if you crave more sights to see, there are also Cathedral Museum and Crypts, the Museum of Archeology and Ethnology and Museum of Olive Oil. After a well-deserved rest, we went out for pre-wedding drinks to Gastroadictos, a very cozy and trendy “wine and tapas” place, located in the cul-de-sac Carrer Palau. Since we were attending a wedding of our Oxford friends, we expected to see a lot of classmates and it was true indeed. So, we had a fun night catching up with people. 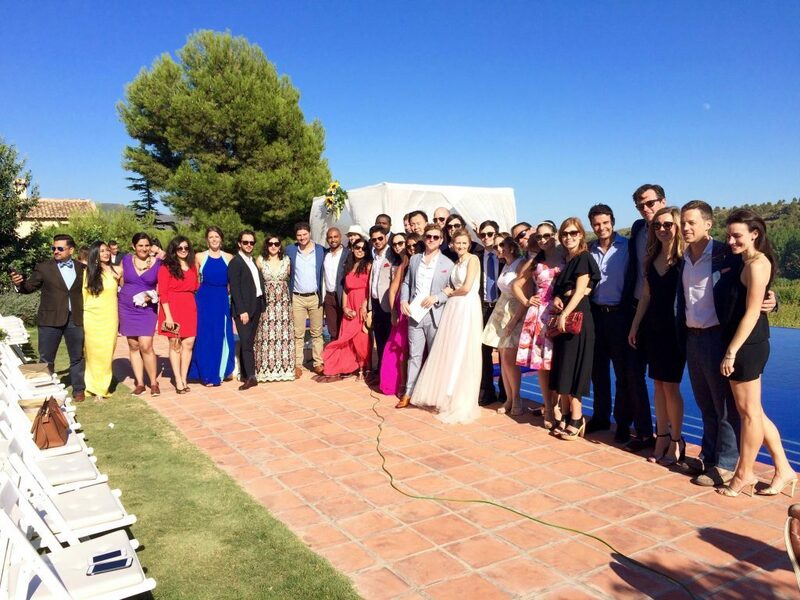 Today, all guests were invited to attend a “Paella + Jamon pre-wedding lunch” located in La Vall d’Uixó (30 mins drive). At around noon, we were all bussed to the covered pick-nick area right next to the Caves of St. Joseph (Coves Sant Josep). Apparently, it is home to Europe’s largest underground river (2,750 ms long), 800 m of which are suitable for tourist visits. We should have gone on a boat ride around the caves, had we known that the lunch would slowly turn into dinner and then into a post-dinner drinking party. However, when we figured out that we wouldn’t be leaving till late night, all tickets were already sold out. 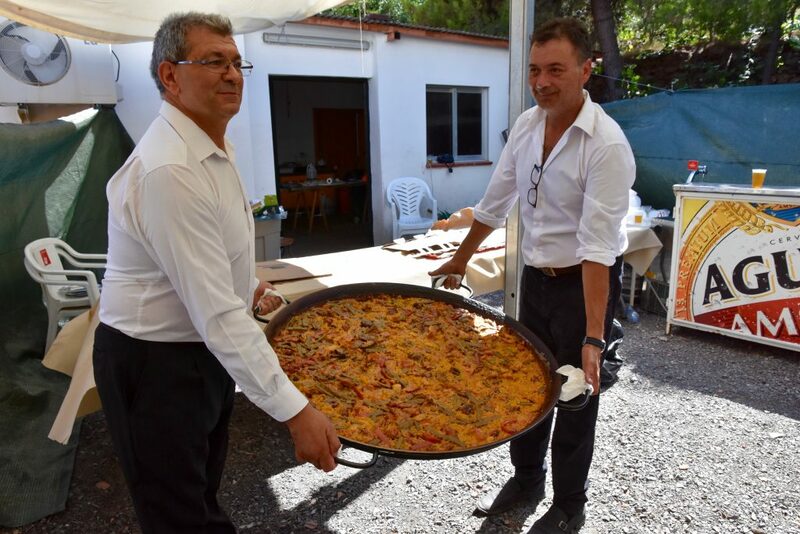 On a high note, the groom’s uncle is a paella chef so the setting and food were an excellent way to savor the real Valencian paella (Valencia is where this dish originated, so don’t trust Sevillanos advertising their paella as “original”). The dish was cooked before our eyes on three large flat pans (another fun fact – ‘la paella‘ is the name for cooking pan itself and not the dish), and once it was ready and the legs of jamon were sliced, the fiesta began…. all the way till 23.00. I got to hang out with all my friends and meet the groom’s Spanish dad and his lovely Armenian mom. Today I had a special treat, Carlos, a friend of mine from Barcelona, was going to drive to Segorbe to see me and meet my husband. We met in Venezuela, while trekking and paddling towards the world’s tallest waterfall, Salto Angel, but the last time I saw Carlos was in 2007, when I came to visit him in Barcelona. So our meet-up was long overdue. And it was definitely a highlight of my trip to Spain too! Carlos came around 11 and since I had a few free hours, we ventured into the city, that I still saw very little of. We simply walked and talked. First of all, we passed by the town’s botanical garden, then we reached the main square, plaza de Agua Limpia, home to Segorbe’s Town Hall (El Ayuntamiento). Former Palace of the Dukes of Segorbe, it was built in the first half of the 16th century by King Alfonso of Aragon and Sicily (who was the second Duke of Segorbe and son of the “Infant Fortuna”) and it was bought by the city council in 1864. Two Mudejas style pieces can still be admired inside: a door with a tracery pattern, and the coffered wooden ceiling of the assembly room, which is an impressive wooden craftwork with octagonal coffers and four-point stars. Both pieces reveal the splendor and luxury that the Mudejar style had in those days. Three marble and jasper entranceways from Cartuja de Valdecristo in Altura, rescued from the ecclesiastical confiscation instigated by Mendizabal, can also be seen in the City Hall. The assembly hall of the Casino of Segorbe, with its Italian style wooden coffered ceiling with squared coffers and eight-point stars, is located just below the City Hall’s assembly room. 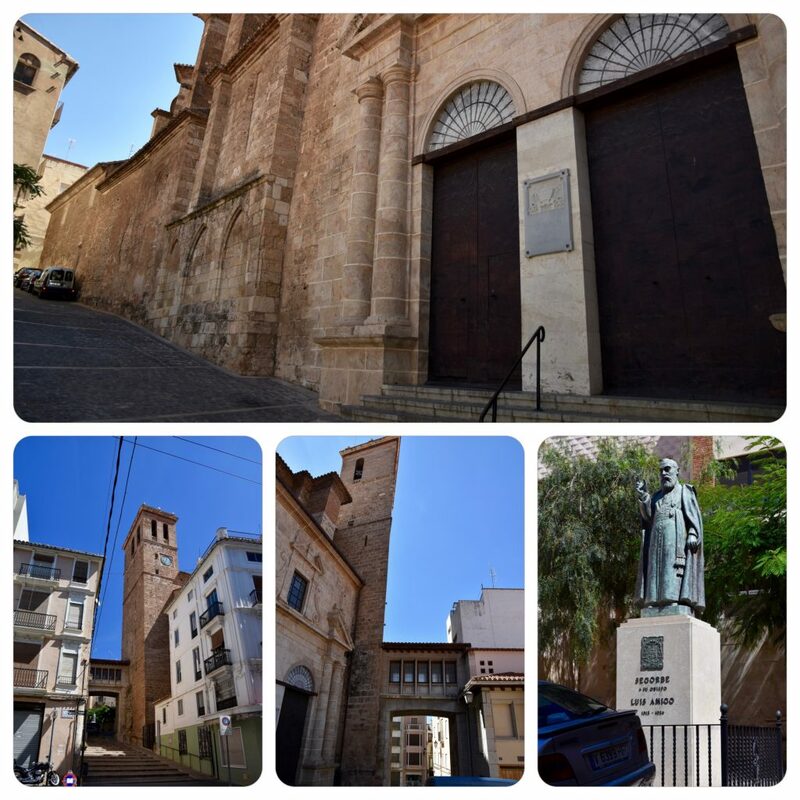 Once we reached Calle Colon, it was hard to miss the imposing Cathedral Basilica of Segorbe (aka Cathedral of the Assumption of Our Lady of Segorbe (Santa Iglesia Catedral de Segorbe) (p.12). Actually, it is a set of buildings comprised of the Cathedral (transformed from Valencian Gothic into Neo -Classical style in the 18th century), the lower Cloisters (15th century) the upper Cloisters (16th century) and the adjoining premises of the old Archive (17th century), the New Library (18th century), the sacristies and the houses (19th century). The Cathedral built over the remains of the old mosque after the conquest of these lands by the Crown of Aragon, was designed in Gothic style around the 12th century. Attached to the southern wall of the city, the Cathedral was lengthened to the north in later centuries. The last major renovation work took place in the 18th century to suit the Enlightenment trend of the time. The cathedral is an artistic ensemble comprising church, Bell Tower, cloister and Cathedral Museum. The church has transformed its appearance in successive enlargements, adding new styles according to the trends of the moment in which they were made. 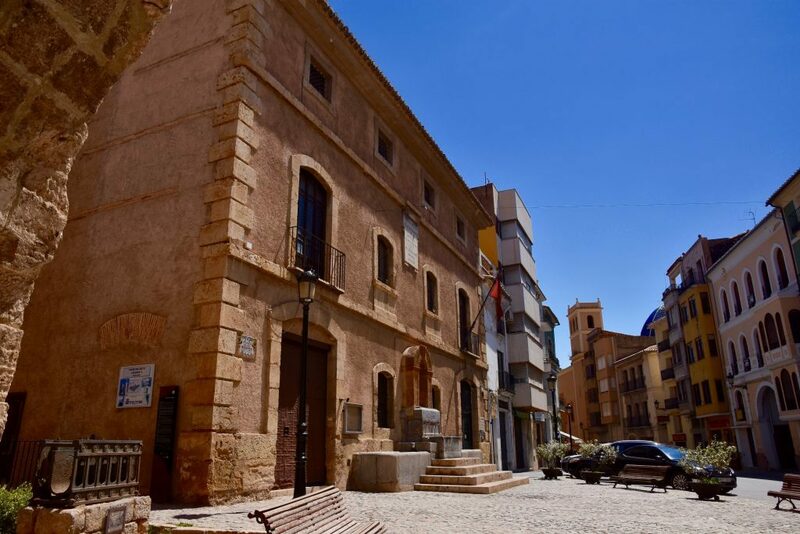 Outstanding is the refurbishment carried out between 1791 and 1795 by architect Vicente Gasco, while Lorenzo Gomez de Haedo was bishop of Segorbe. Materials salvaged from the Castle of Sopena were used to rebuilt the church. It has become the only pure Academic style example of religious architecture in Spain. Inside the nave, visitors can admire paintings of Jose Vergara, and frescoes on the dome by Manuel Camaron and Luis Planes. Built between the 13th and 14th centuries on the trapezoidal ground-plan due to its proximity to the walls, the quiet and peaceful Gothic cloister invites the visitor to meditate. Seven of the original chapels are still preserved around the cloister. Particularly impressive is the Chapel of the Savior (16th century) which can be found behind the golden baroque door from Cartuja de Valdecristo, framed in a beautiful Gothic entranceway. Inside, visitors can also admire the breathtaking Valterra Tomb and the great main altarpiece of the Cathedral (16th century) which is considered a key work of the Spanish Renaissance by the famous Valencian painter Vicente Macip and his son Juan de Juanes. The Cloisters how house the Cathedral Museum and it is one of the most important collections of holy art in the Valencian community. It holds a major collection of religious art, including painting, sculpture, gold and silverware, ornaments and other objects. An essential collection of Valencian art of the Gothic, Renaissance, Baroque and Neo-Classical periods, with works by Joan Reixach, Pere Serra, Martin Torner, Rodrigo de Osona, Vincente Macip, Juan de Juanes, Juan Ribalta, Gaspar Huerta, Vicente Lopez, Jose Camaron, etc. as well as a relief by Donatello (15th century), a triptych of Limoges enamels (16th century) and religious ornaments and gold and silverware (15th to 20th centuries). Following the old narrow streets, we came to another church – Church of San Joaquin and Santa Ana (Iglesia de San Joaquin y Santa Ana). Solemnly blessed in 1695, the church is all that remains of the former monastery of the Order of Mercy. It features a single nave and chapels between the buttresses. This Church is a prime example of Baroque exuberance in Segorbe for its rich Baroque decoration, the profusion of stucco carving, the ornamental motifs of leaves, rosettes, cherubs and supporters of coat of arms, as well as the abundance and beauty of its sgrafitto. The exterior shows an interesting play of proportions and a fine facade chapel flanked by the Bell Tower and a steep staircase that gives access to the church. Although the author is unknown, for style reasons the authorship could be attributed to Perez Castiel and his assistants. We were at the foot of the hill-castle of Estrella (Cerro-Castillo de la Estrella) (p.9). 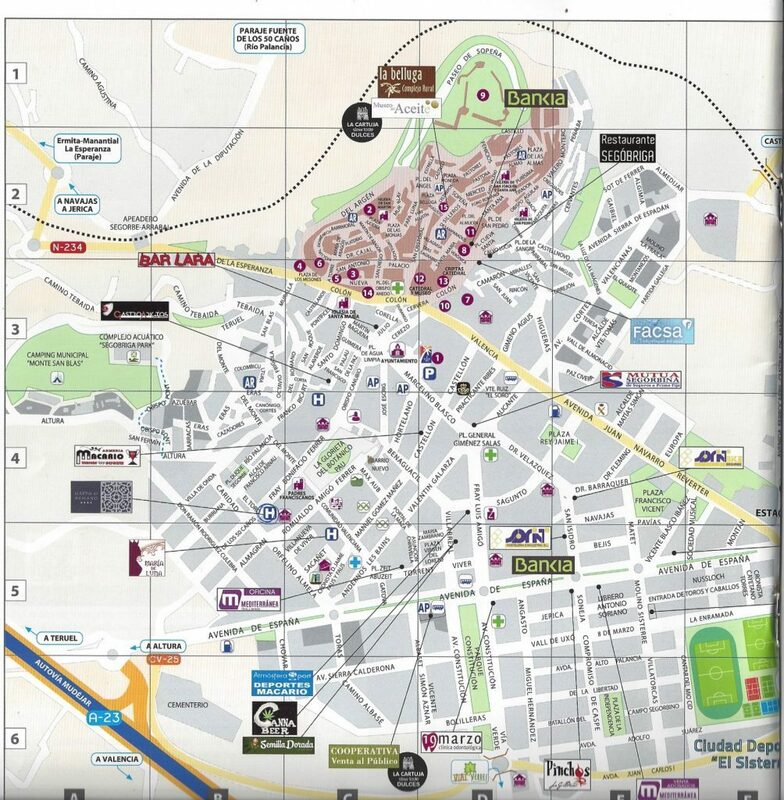 Sopena hill was the center of power of the Alto Palancia district for more than 1000 years. Throughout its history, this enormous complex was inhabited by kings and nobles, surrounded by thick walls, watch towers and armed men for defense. Nowadays, it bears no resemblance to the idealized image depicted on the altarpiece of the High Altar of the Cathedral. Next to the remains of the last reconstruction made in the 19th century during the Carlist Wars, only old pine trees are solely dedicated to provide shade to a wonderful walks that run through the hilltop, making it the most tranquil place in Segorbe. It is, nevertheless, substantially different from the past: there are no kings or nobles fearful of their fate now, just ordinary citizens looking for the caresses of the wind in spring, for the summer shade, or the sounds of the slow paces of the autumn leaves, or even the solitude of silence in winter. The Moorish leader Barani of the Sinhaya confederacy built the first Alcazar, which stood as an important stronghold for centuries here. The first document references to the Castle of the Star dates back to 1092, when the emir of Valencia, al-Qadir, ordered that his treasures were kept here. It was ceded to James I of Aragon by Muslim king Zayd Abu Zayd, when he became Christian and was declared an ally and the vassal of the king, becoming the governor of Valencia on his behalf in 1229. Another reference has survived from 1257, when James I charged Guillermo de Anglesola with the custody of the castle and obligation to keep an 8-men garrison there and to pay a certain annual rent. In the 14th century the old fortress was turned into a royal residence, when Dona Maria de Luna of Segorbe married the king of Aragon, Martin “the Humane”, who spent long periods of time here. When the king died without an heir, Segorbe Castle came into the hands of his grandson Don Fardique, an illegitimate son of Don Martin of Sicily, and it was immersed in the affair of the Caspe Commitment, during which Segorbe played an important role by taking the side of its legal lord, and in the historical records, the castle was mentioned repeatedly as a place where the treaty was signed. However, the real transformation of the castle into a permanent fortress and residence of dukes occurred during the rein of “Infante Fortuna” who reconstructed and expanded the castle. When the dukes moved to the Aqua Limpia Palace, the Castle fell into disrepair. In the 18th century Bishop Lorenzo Gomez de Haedo decided to build a new hospital, by salvaging the stone from the Castle and using the materials for the new construction, thus completely destroying the Castle. Finally, over the course of the 19th century new defensive works were build on the Cerro de Sopena during the Carlist wars, the remains of which are all that is currently preserved. It was a truly serene place to walk around and enjoy the beautiful panoramic views of the city as well as the remains of the Castle. At the top of the hill, Carlos and I met a recent refugee from Ukraine who with his family recently settled in the area. While my prior conversation with Carlos was about dire economical situation of Spain and its high unemployment rate, the Ukrainian man, who immigrated to a small village, was very content with his life and work, he was able to find. But he was especially fond of the Spanish history, culture and weather. I am sure, it was a big contrast with what he was used to in Ukraine. 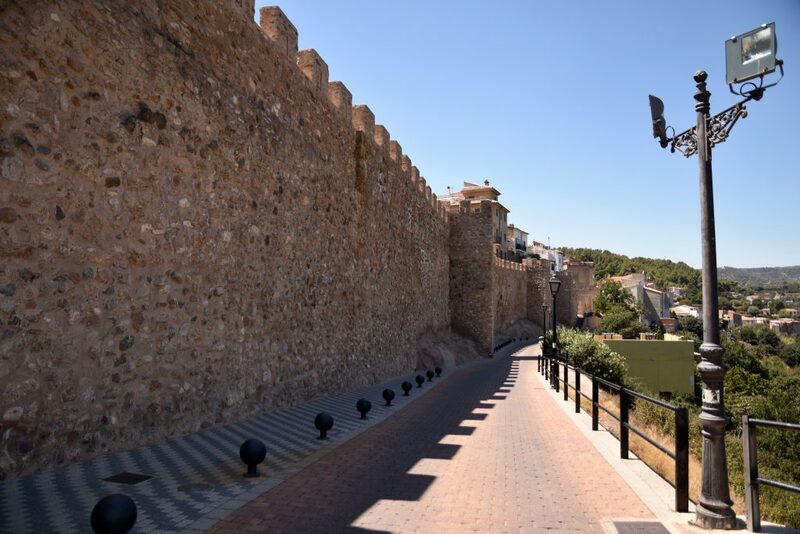 We came down the hill and walked along the City’s Medieval Walls (Muralla) (p. 2). Almost a km long, walls extended from the castle were built sometimes prior to the 11th century. The growth of the city required constant restructuring of its walls and over the centuries they were modified and extended on multiple occasions. The remaining walls belong to the 14th century layout and can still be seen in Argen Street, where we found the panel framing the Moorish arches of the Portal of the Argen, the old gateway to the city, dating from the 11th century. As we walked down, at the end of the wall, there are the remains of the Medieval Aqueduct (Acueducto) (P.4). The Arab world masterly resolved how to transport water from one place to another. The Aqueduct of Segorbe, dated between the 11th and 12th centuries, is another example of the exquisite works of engineering. However, the part which can still be seen today with its ogival arches belongs to the 14th century. One of its pointed arches was removed in the 19th century in order to widen the main road of the time. An iron channel was placed to allow the water flow from the Fountain of Hope. As my time was running out, we proceeded back to the hotel and on the way stopped at the 14th century Prison Tower (Torre de la prisión). The doors are the weakest parts of the walls. In order to protect them, defensive towers were built on their sides. 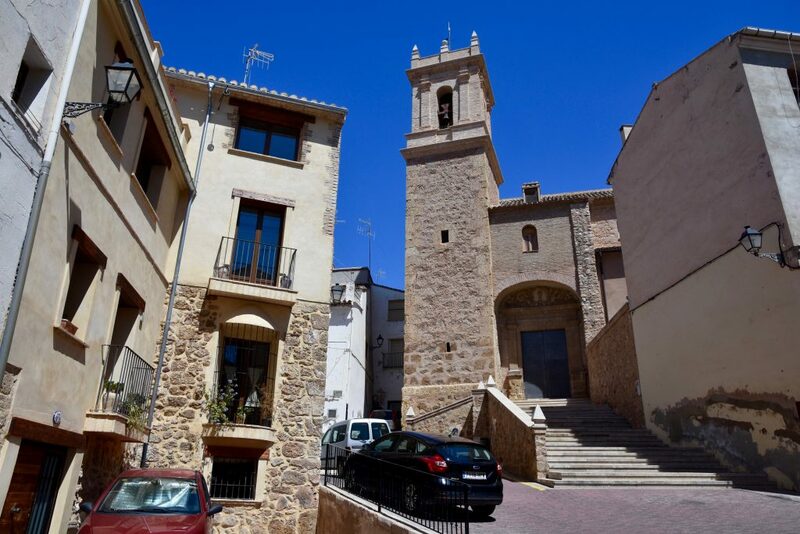 The clearest example in Segorbe is the Prison Tower, located next to one of the old city’s gateways, the Portal of Teruel. Externally, the tower is cylindrical with a lower body of larger diameter where the prisoner cells used to be located. The second body has a diameter of 8.7 m and it is internally divided into two-story octagonal sections, with cross Gothic vaults, arrow slits and communication to the terrace by a spiral staircase embedded in the wall. Its total hight is 21.3m. By the time I got back to the hotel and said my goodbyes to Carlos, my make-up artist arrived. I was a bit skeptical about local beauty professionals (since I had a very bad experience in Venice), but the lady-artist, even though she didn’t speak English, did an amazing job for just €25, we communicated with pictures and gestures. After my husband and I got ready, considering the events of the previous night, we decided to drive to the venue, Hotel Masia Durba, ourselves. When we arrived, the place was beautiful – from the views to the set up and overall ambience. It was a great fun to celebrate with Ingrid and Chris their nuptials and spend yet another evening with our old friends and classmates. 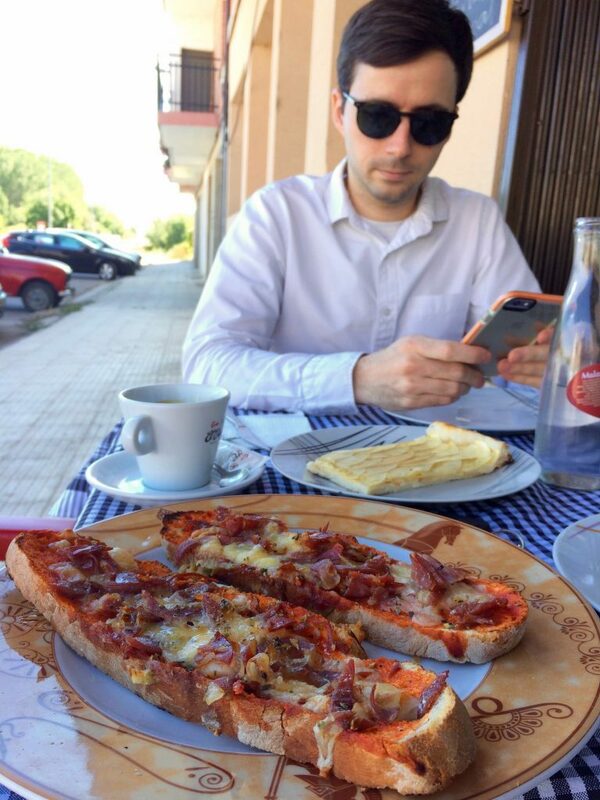 Since Joel, was traveling with us in Andalusia, we had no time to waste, and after a speedy early brunch with a wedding party, we embarked on our next ride to Granada. This entry was posted in Europe and tagged Castellon, Castle of the Star, Caves of St. Joseph, Church of San Joaquin and Santa Ana, Gastroadictos, Hotel Masia Durba, jamon, La Dispensa de Monreal, Martin El Humano, Medieval Aqueduct, Medieval walls, Molina de Aragon, Monreal del Campo, paella, Prison tower, Segorbe, Segorbe Castle, Segorbe Cathedral Basilica, Spain, Valencian Country, Zayd Abu Zayd. Bookmark the permalink.